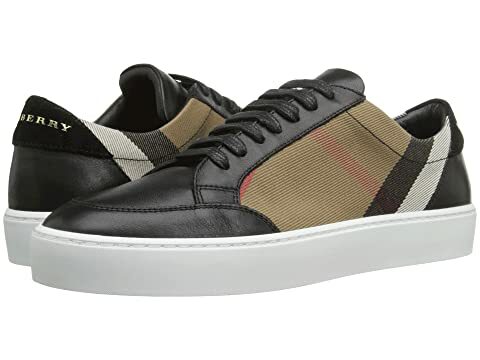 Sneakers made of leather and checked cotton. Burberry brand logo detailed at back of heel. We can't currently find any similar items for the Salmond by Burberry. Sorry! Absolutely beautiful. Very comfortable and stylish. I wear between a 8 1/2 and 9 in sneakers. I bought a size 9 and it fit nicely on me. 5 stars all around! I purchased the house check/gold sneakers and they are GORGEOUS!!! Very comfortable and make any casual outfit look great. Highly recommended. I usually wear size 6, but purchased size 5.5 and they fit perfectly. These first caught my eye on a lady wearing them. I instantly fell in love and purchased them! They are SUPER CUTE! Packaging came nicely, as if purchased directly from a Burberry boutique. Love the versatility of being able to pair them with jeans, skirts, or yoga pants! LOVE them!